The basic idea behind that post-earthquake jam was, "Hey--everybody's out-of-sync. Let's see if we can come up with some activity that will get us all back on The Beat again." We figured that if we sat down with a bunch of instruments and a serious desire to listen and play with each other, somehow the rhythm would just find us and make everything all better again. 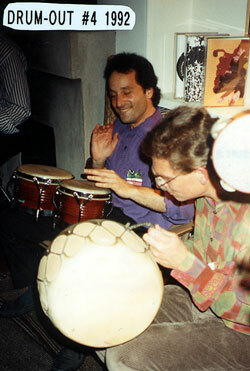 The first official Drum-Out was held New Year's Eve-Eve, l989. Most of the instruments came from a Latin percussion auction that was serendipitously held a few weeks before our event. (Congas for $50.00, A dozen Claves for $1.25 each!) About 50 people came over to find The Beat with us, and memories of it were positive enough to consider hosting D.O. 2. 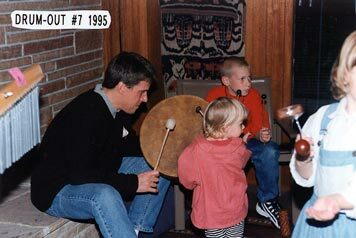 Drum-Out 2 was held on New Year's Eve-Eve, 1990. About 90 people (only some of whom we knew) came over to find The Beat with us, and the anarchic pounding that resulted from that madness could be heard waaay down the block. This time, we had gone too far. After much throat clearing and hand wringing, Drum-Out 3 was finally scheduled for February 29, 1992 - Leap Year Night. This event began as a more sensitive, scaled-down event focusing more on listening and interacting than on brute cathartic release. Things began tentatively - nobody wanted to rush or impose too much - so when The Beat finally hit, it exploded. 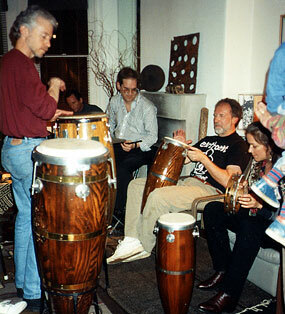 In 1994, the Drum-Out tradition moved to Sausalito. Drum-Out 6 seemed to fit well into our new home, and by Drum-Out 7, many of our neighbors were coming over to join in the chaos. At Drum-Out 9, a new wrinkle was added when the wonderful musician Dean Monroe (fresh from Drum Circles in Santa Cruz) stood in the center of the room and conducted. Another great addition to our festivities is the Official Drum-Out Shuttle-Jeep (ably manned by our friend Sam Hsu) which transports guests from the parking to the drumming and back again. With Drum-Out 12 looming on the horizon, we are extremely pleased to be taking our proud tradition to the World Wide Web. Special thanks to our pal and D.O. regular Bill Krauss for making this a reality. If you like his work, you may consider contacting him to find out what he can cook up for you. Each year, the usual guidelines apply: If you can't hear the people around you, you're probably playing too loudly. Listen - let the rhythm tell you what it needs. What are the various and subtle sounds you can coax from your instrument? Is it your turn to solo, or your turn to support? Are you hitting this thing so hard as to cause it or yourself damage? I mean, face it ‹ some instruments are just made to take a greater pounding than others. Every Drum-Out has had its own unique ebbs and flows. Sometimes, spontaneous "call and response" type rhythms appear out of nowhere. Sometimes, just when you think The Beat has left the building, it decides to return with a vengeance. But one thing that each Drum-Out has shared is a moment where everybody in the room just kind of looks at each other and says "Wow - do you hear what we're doing!?!?!" Another feature of each Drum-Out is an abundance of famous Juline Cuisine, including her World Famous Chili, and 100% Calorie, Fat and Cholesterol Free (Yeah, right...) Trifle. We have lots of percussion stuff available to play, but if guests have non-fragile and non-electronic devices that they'd enjoy whomping on for a while, they're free to bring them. One year, a guest brought a mannequin and a few mallets. It sounded like a great idea, but it needed amplification. Acoustic mannequins only! "Special Friend" and "Spousal" units are welcome, as are "Kid" units who like music and don't need constant supervision. But when this thing gets too crowded, nobody has a good time, so we ask people to use their good sense and discretion. We provide an abundance of famous Juline munchies, so all our guests have to bring is a small quantity of some sort of beverage (soda, water, juice, beer, wine, etc. ), a non-perishable item for the Marin Food Bank (if so moved), and a serious desire to find The Beat. Over the years, we've noticed that the Drum-Out rhythm is kind of like a big bonfire with all of the players around it adding to the flame. The people who seem to have the most fun are the ones who were there when the first sparks were ignited. We're quite proud to note that some Drum-Out regulars look forward to this event enough to arrange their Holiday travel plans so they can be here with us on New Year's Eve-Eve. This yearly experiment in semi-chaotic anarchy is the only party we know of that asks the question "Can a large group of people who don't necessarily know each other, without a great deal of rules or supervision, find and sustain a compelling rhythm without breaking anything?"